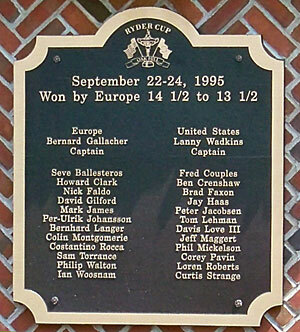 Oak Hill played host to the 1995 Ryder Cup matches between the USA and Europe. Team Captains were Lanny Wadkins (US) and Bernard Gallacher (Europe). The 31st Ryder Cup matches were settled in the final-day singles which the US started with a three-point lead. Rookie Phil Mickelson was unbeaten throughout the event but strong all-round European performances culminated in Philip Walton two putting for bogey on the last hole to beat Jay Haas and claim the Ryder Cup. Europe 14 ½ - USA 13 ½. The Ryder Cup was played at The Belfry in 1993 and at Valderrama in 1997. “Mirror, mirror on the wall, who is the fairest of them all?” Well, according to the top touring pros and the Seven Dwarfs, it’s the Oak Hill Country Club in Rochester. For this venue is regarded, almost universally, as the fairest but most challenging course on the US major circuit. When Oak Hill Golf Club started out in life back in 1901, golf was played on a barren rudimentary nine-hole course set close to the banks of the Genesee River. Things at the club remained low key until the beginning of the 1920s. Or so the members thought. Little did they know that the University of Rochester had their hearts set on a new riverside campus, which they wanted to develop on the site of the Oak Hill course. Fortunately, for Oak Hill, the rich University had land and cash to spare and a trade-off took place – 350 acres of farmland plus $360,000 for 85 riverside acres. Naturally Oak Hill grasped the golden opportunity and commissioned Donald Ross to build two courses on the new site at Pittsford. Tens of thousands of oak trees were planted, and the new Oak Hill gradually started to take shape. Before play commenced in the 1956 US Open at Oak Hill, Ben Hogan suggested that the East course was not hard enough to host this top event. After missing a short putt on the penultimate hole and losing by one shot to Cary Middlecoff, Hogan changed his tune and declared Oak Hill’s opening hole to be the toughest he’d ever played. Since then, Oak Hill has been a regular US Open and USPGA venue and only the world’s very best golfers have managed to better the Oak Hill par. 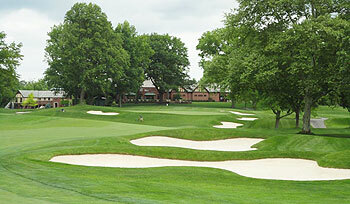 The venerable Oak Hill is in fact the only club to have played host to the U.S. Open, PGA Championship, Ryder Cup, U.S. Amateur, Senior U.S. Open and Senior PGA Championship. The PGA Championship returned to Oak Hill in 2013 after a ten-year gap when, in 2003, Shaun Micheel became a surprise major winner. 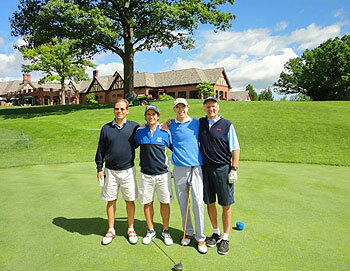 Oak Hill’s East course is ideal for major championship golf as it’s a never-ending long slog. The very first hole is an immediate introduction to the skill needed to play this course. Its index 1 right out of the gate and plays more than 475 yards over a creek with thick rough lining the doglegged fairway. The topography at Oak Hill is relatively tame with approximately 20 feet change in elevation in places, but the sheer length of almost every par 4 with many uphill approach shots to ‘cereal bowl’ Ross greens makes this layout brutal beyond words. The rough is kept dense and the mature trees are large which dominate many sight lines tightening up plenty of protected landing areas. There are proposed plans in the near future to make a number of dramatic changes to the course to make it “more Ross like” which I struggled to grasp as none of the proposed changes are original. Such changes include the construction of a new par 3 on the front side to a green which currently serves as a practice green in the far corner of the property, and renovating the awful par 3 15th hole which was truly ruined by Tom Fazio. The routing will be reconfigured and existing holes/features will be retired. There are a number of other changes in the works, many of which made no sense to me – and I can imagine the internal politics behind the scenes at one of America’s most historic clubs. The majority of members prefer playing the West course as it’s much more user-friendly and fun. The East course will always be the highlight of the club, but it will beat you up constantly – resulting in less frequent play by the regulars. I think it needs a banner like that famous sign on the first tee at Bethpage Black. Let’s pray to God that the (somewhat alarming) modifications are carefully navigated. So much of the conversation the Empire State involves discussion of courses hailing from either Long Island or Westchester. That's understandable. The two areas are littered with the best depth of private clubs in all of America in my mind. To its credit, Oak Hill in Rochester has steadfastly maintained a presence through the hosting of key national events and in '95 when hosting the Ryder Cup Matches where Team Europe vanquished the American side. The initial qualities Donald Ross provided should have been sufficient for the club. Yes, it's fine to engage another architect to restore old time elements, but not to the point where the newest hire indelibly places his/her fingerprints on the layout. After the 1968 US Open in which an unknown -- at that time -- named Lee Trevino tied the 72-hole championship record set a year earlier by Jack Nicklaus at Baltusrol. The club believed certain fundamental changes were needed in order to strengthen the course for future hosting of major championships. Tom Fazio was brought into the picture in the 1970's and the changes created provided a clear split between the core Ross elements and the new ones inserted. Sad to say, but often when clubs hire an architect there's an attempt -- whether consciously or unconsciously -- for the new architect to feel compelled to alter the landscape. A great example of this comes with the dynamic short uphill par-4 14th which Ross created. The hole is simple in its presentation but devilish in terms of securing the lowest number. When you get the par-3 15th you encounter a clear example of a hole that provides your basic Fazio inclusion. The holes don't match and the course experience suffers because of it. Restoration is neither a small task nor fully appreciated by many architects. The original intent should be studied rigorously before as much as the first tablespoon of turf is moved about. Club leaders intent on chasing major events can be seduced by the siren's call and sacrifice so much in the process. The East is a demanding layout and much of that is tied to the added tee boxes included over the years. Once can see this clearly with the ultra-demanding long par-4's at the 17th and 18th holes. The club has seen fit to eliminate way too many trees that previously existed but more on this front can happen too. A winding creek so much a part of a number of holes on the outward half shows the brilliance of Ross. The opening hole is rightly touted by Ben Hogan as one of the strongest openers in American golf. The PGA Championship will return to the East Course again in '23 -- but in the month of May. The timing will clearly push the facility to be ready so early in the season. Personally, I'd like to see the club restore the Ross features but it's doubtful given the significant investment the club has already spent to get the layout it has now. The lesson learned is a simple one -- when making changes to a highly acclaimed course be forewarned the "improvements" may actually result in a significant setback than one was actually hoping to happen. After playing Oakhill last summer, I thought it was great but rankings are a little high. Upon reflection, I agree with the rankings. The one thing I didn't like was the narrowness and how penalizing it was if you missed the fairway. If I missed the fairway, trees usually prevented me from going for the green. I haven't played other courses in Rochester, NY, but driving in all I could think was this was perfect land for golf. It has rolling hills, but they are not severe like mountain golf. Oak Hill has a good layout with great hole after great hole. The greens are unmistakably championship Donald Ross greens. If they opened up the course a little bit with some tree removal, I would say it is Top 25 worthy in the U.S. I had a tee time around 10am, but arrived early to enjoy all the pre heating routine at maybe some of the best facilities my golfing life has showed me: great locker rooms, a proshop where you wish to buy everything and a putting green with the exact fast speed as the course greens, including a small hole of maybe 30% of the standard one on order to practice the shorter putts and improve your accuracy. I played with three members who I have met 2 years before and not only they spoke about the course and the club but also the secrets of each hole. I cannot say nerves, but I felt anxiety and wanted to see how my game reacted to a tough test of golf. We played the blue tees for around 6800yds which is quite long, but far away of the 7200yds the Tour Pros play and believe there is a huge difference. Willie, one of the Members, had one special story at every hole starting from the 1st which was described as the toughest starting hole in golf by Ben Hogan. When we arrived to par 5 fourth hole another special one was showed: the “nineteenth hole”, an extra hole (par 3) which is used for practice or when one of the main 18 needs to be repaired. Then at 5th I was reminded Tom Kite’s errant tee shot which after missing a 30 inches putter cost him a triple bogey 7 in the 1989 US Open won by Curtis Strange. And in 6th hole we had the story on the four holes in one during that same Open; Willie told me the roars were extremely loud. The story is that all 4 of them were made with the same club, the 7 iron. I hit a great 8 iron 15 feet short of the pin, wrong club! The final 3 holes are very tough par 4s specially 7th were your driver needs to be accurate an short of a creek before heading a long iron to a very well protected green with OB if you are long. And 9 is one where you need to be sharp with the tee shot in order to have a clear second shot to the green. Once finished you enjoy the fantastic half way house and the premium white hot dog (Our “Choripan” here in Argentina) which you order using the phone on the 9th tee box, before heading for the fantastic final 9 holes. Tee shot at 10 after eating is not easy, but the course turns very special from 12th hole (Leaning Oak is the name): a very tough par 4 with an upright second shot into another very severe green. Then 13th, maybe one of the two best par 5s I have ever played together with 15th at Pine Valley in NJ. 14th is that “reachable” par 4 (only for Pros, I smashed it and had no chance!) where the second shot is short but very tough. Par 3 15th is that one where you could choose the pin position for the fourth round of the PGA Championship and with 16th run by Irondequoit GC, another Donald Ross Jewel (which I will later describe). Final two par 4s are as tough as you can imagine, especially 17th where the tee shot needs to be long and accurate. And 18th second shot if not on the fairway, has to be a lay-up as stopping the ball on that green is impossible. Many of us will remember the fantastic 7 iron from Shaun Micheel in the 2003 PGA which gave him his only Major Championship; there is a plaque that remembers that shot. It seems that the 7 iron wants to be the most remembered club at Oak Hill!! But how many remember of Faldo laying up in the 1995 Ryder and the making up & down from 100 yards to win his match? A great round of golf, a fantastic test of golf and a Golf Club that needs to be taken as an example of how a Club has to be run by its members and employees, everyone there is deeply proud of the place they belong to. There is little I can add on these words, maybe saying the trees at Oak Hill are impressive and during fall you might watch the nicest colors nature can show. Or how good Donald Ross was to create challenge around the greens, but to really experience it you need to play here. I can say that was successful with the golf test, but more than that I was impressed of how good a course can be and for sure it should be higher in any golf course ranking, I put it maybe at the same level as Winged Food West from A.W.Tillinghast. A great variety of holes requiring you to move the ball both ways and know where to put it on the green. Tiger said it best, "it's the hardest, fairest golf course I've ever played". It's a hidden gem because it's not in the mainstream US cities.